A bowl of past fagioli soup on a plate with a spoon in it. 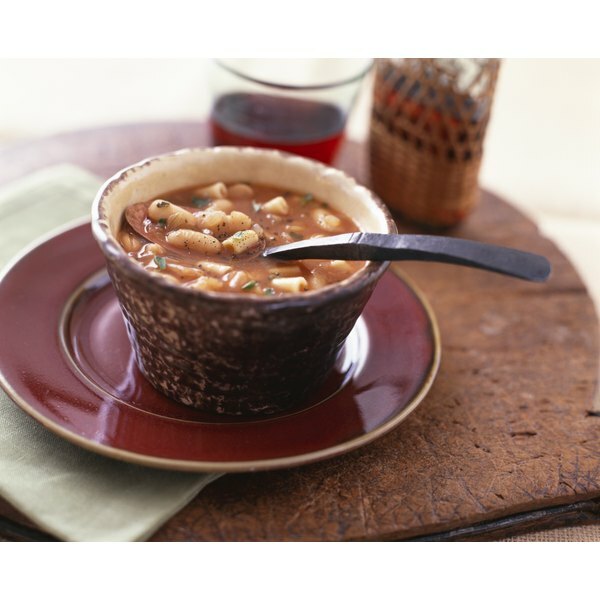 Pasta fagioli is a traditional Italian soup made with small tubular pasta, white beans and a tomato base. The relatively high calorie count is the result of the carbohydrate levels of the pasta and beans. Homemade pasta and beans allow you to customize the soup, adding ingredients like sausage or spinach, or utilizing different types of beans or pasta. "Taste of Home" published a recipe in September 2007 that utilized turkey sausage and had 228 calories per one and one-third cup serving. A 19-ounce can of most commercial brands of Pasta Fagioli soup contains approximately two 1-cup servings with 160 to 180 calories each. Italian restaurants from national chains to family-owned kitchens serve pasta fagioli. Pasta fagioli can also be found in frozen condensed packages. Each one-half cup serving has 130 calories.